Glienicke Palace is a very famous attraction in Berlin. The glienicker Bridge that connects Wannsee to Brandenburg capital is named after this palace. 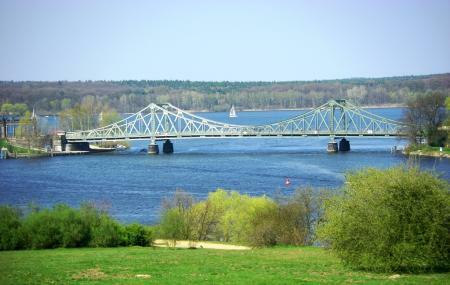 The bridge runs over Havel River and is one of the best bridges in the city to travel by. This bridge has a lot of historical prominence as well and is one of the oldest bridges in the city of Berlin. It was made in the year 1907. The bridge has a touch of history still remaining, but it had to go through major reconstruction after it was damaged in World War II. How popular is Glienicke Bridge? People normally club together Grunerstrabe 20 and Vogelpark Und Streichelzoo Teltow while planning their visit to Glienicke Bridge.